In F1 2015, you must use your shoulder buttons very carefully because otherwise you quickly end up in the gravel or involuntary donut turns. Especially important: accelerating and braking. Express when accelerating shoulder button all the way down through, it quickly loses control of your cars and their crashing into the nearest wall - it is quicker than you think. Especially when exiting a curve you have the keys with feeling press. If you happen to apex of the curve, you go slowly on the gas, and then press fully when retracting the tube. The situation is similar with the use of brakes. If you access a bend too fast or too late your wheels and your car slides straight into the gravel. Pressed shoulder button careful when entering the curve and express only through completely when you have become a little more slowly. As always go curves from outside to inside. So you take with plenty of speed. Tip: if you have any problems with the distribution of gas and brake, you can activate the traction control in the driving aids. Even if you can trace all route patterns in your sleep, you should initially turn on the racing line. So you learn not only the fastest route round the course, but also the perfect braking point of all the curves. 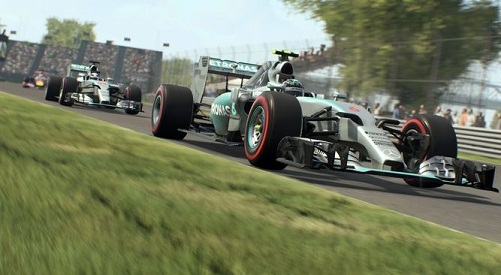 We recommend you also once to stay behind the AI to get a feel for the fastest lap. So you know immediately where overtaking is useful and where your opponents are particularly strong on the brakes. In addition, it makes sense to complete the training sessions each session. In order to lay down the fastest lap in qualifying, you have to know the track. The ideal line helps you in this. There are many possibilities and ways to overtake. Here you would of course avoid any collisions, although you can use the "flashbacks" to rewind the action. We encourage you, especially often to overtake in curves. Select for later braking points than your opponent and drive past them inside. Careful though! Some of the drivers are kept strictly on the ideal line and shy by no means a collision. They often meet you at the rear tire, which leads in most cases to a flat tire or a spin. Alternatively, you can use the slipstream to your advantage. Keep close to the line behind your opponent and leave the racing line as late as possible. The slipstream buys you a better top speed, can be enhanced in addition to DRS. The DRS (drag reduction system) or "system for reducing the aerodynamic drag", you donated a speed boost of about 15 km / h. The rear wing of your car is hydraulically flatter asked to produce less drag. Do you get the OK of your mechanic, you can see the DRS zones on the map. You should use the tempo push only on the straight. Through the open wings, you lose in the curves on aerodynamics and flying fast off the track. Remember that you can only use DRS when you are in one of the zones, and no more than one second behind your front man. In addition, the rear wing will return to its original position once you press lightly again on the brake pedal. You take part in online races and have pronounced driving skills despite no chance against your opponents? This could be due to the self-created setups of professionals. Take your time and look at the different settings of your vehicles. Especially during transmission or at the wings enough slight changes to the original setup to be a few seconds faster. To improve the speed of your F1 car, it fits, for example, the length of the last and seventh gear. The course is worth it just for courses with many lines as the "Circuit de Catalunya Barcelona" in Spain. For a curvy stretch like Monaco, you should go with a lot of wing for open slopes like Bahrain or Canada with less wing. Every now and then it starts to rain in the middle of the race. Very important: If strongly on the racing line. Here the water is removed quickly, because all drivers follow this line. So here you have the most traction. You should have to leave the racing line for overtaking, considering the longer braking distance.